Nutella fans, these two awesome contests are back! 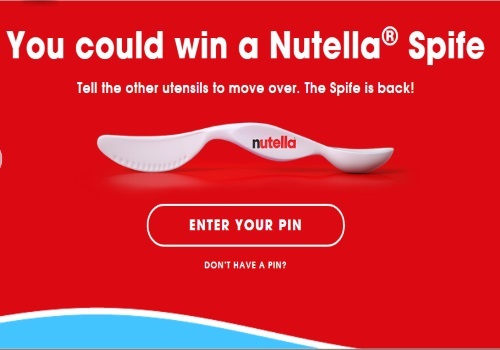 Nutella Spife Instant Win Contest - Enter to win a Nutella spife (half spoon half knife). Purchase specially marked Nutella products and locate the PIN code. Enter it at the link below for your chance to win. There are 40,000 prizes available. Contest closes October 31, 2016. Nutella Spoon It or Spread It Contest - This is an instant win game. You could win prizes including Nutella free product coupons, t-shirts, panini press, waffle iron, and stand mixer. Contest closes October 31, 2016. Limit 1 prize per household. Nothing happens, no game shows up. Thanks I won a tshirt!